What attribute correlates most strongly with career success? People often point to externals – an ivy league education or a well connected family member. Occasionally, they’ll cite internal aspects – an abundance of talent, chart-topping intelligence or an immutable work ethic. The more nihilistic might chalk it all up to luck – just being in the right place at the right time. Without question, all of those factors will help, but none of those will get you anywhere without the right frame of mind. What you really need is a growth mindset. A discovery by psychologist and Stanford professor Dr. Carol Dweck, a growth mindset is the innate understanding that abilities and intelligence can be developed. Perhaps that sounds obvious to you. “Of course abilities and intelligence can be developed”, you say. It sounds like something everyone believes, but it very much is not. Have you ever told told yourself “I’m bad at math” or “I’m a terrible public speaker” or “I’m not good with people” or “I’m not really the creative type”? Every one of those statements reflects a fixed mindset, a sense that you have some innate or genetic limitation. This is more pervasive and insidious than it seems. The difference between those who generally adopt a fixed mindset vs those who adopt a growth mindset is shocking. 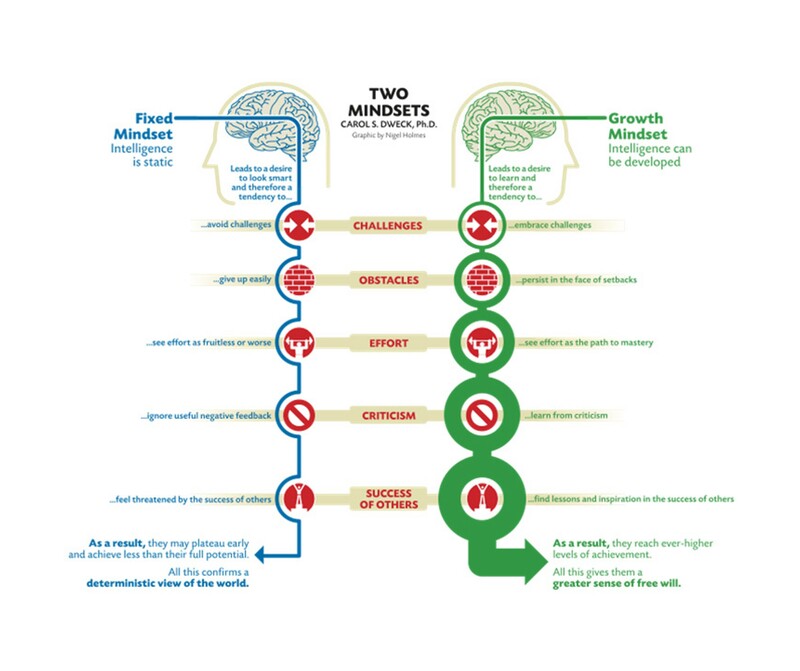 In every testable outcome students who exhibited a growth mindset in Dr. Dweck’s studies outperformed those who exhibited a fixed mindset. I have absolutely seen this proven true in my own life. Throughout my career I’ve actively pursued growth in areas I knew needed development. Early in my career I realized I needed to hone my creative chops. I was strong with strategy, business development and operations but was never looked to as the creative lead on a project. I knew to advance to the highest levels of my field that needed to change. So, I actively put systems in place to develop my taste, my aesthetic eye and my ability to deliver useful creative feedback. I wrote every day. I attended art galleries. I started a photography blog. I sat with senior creative people as they brainstormed and refined creative executions. I made a commitment to spend at least 5 hours every week developing my general creative abilities. Within 3 years I was promoted to the Vice President of Strategy & Creative at my company (along with a $50K/year pay bump). Under my creative leadership our firm received 3 Webby Awards, 1 Cannes Lion and became the agency of record for one of the biggest animated motion picture studios in the world. It was the most prolific period of my career that generated some of the most inspiring and rewarding work I’ve ever produced. But this isn’t about me. Over and over in my career I’ve watched colleagues that focus on their personal development be rewarded with promotion after promotion. Meanwhile, those who stubbornly refuse to develop simply never flourish. I’ll never forget one employee in particular while I was leading the digital organization for a Fortune 100 telecommunications company. This employee reported directly to me as a first line manager running our most critical function (new customer acquisition). She was someone widely seen as a leader on the team, delivered at the highest level of excellence, worked incredibly hard, and expressed a strong point of view. She was proactive and explicit about her desire to get promoted to the next level and take on more responsibility. She was far and away the most talented and invested member of my team and would have been an obvious candidate for the next round of promotions. Unfortunately, she was a briar patch of drama and conflict. Even people that liked her made comments about how prickly and aggressive she was. I tried to coach her through different styles of communication and had shared a lot of formal and informal feedback that her personal style was holding her back. I remember vividly joining her for a drink one evening and candidly telling her “you don’t get along with people and you’ll never get promoted until you address it.” She looked me dead in the eye and said “this just isn’t something I can change about myself, it’s who I am.” It’s five years later and she still doesn’t have that promotion. Everyone can develop a growth mindset. Foremost, it starts with an honest acknowledgement that you are a work in progress (we all are) and the genuine belief that your skills and talents can be honed through consistent effort. There is a great deal written about how to nurture a growth mindset, however I’ve found the following most applicable and tangible. I’m not a huge fan of the recent push to celebrate failure, but an even worse mistake is to view failure in an entirely negative and destructive light. Most people will acknowledge you’ll never get better at anything without making and learning from mistakes. So certainly, don’t let a fear of failure keep your from trying something new or practicing in an area of development. But this is just the start of a healthy relationship with failure. To really get ahead you need to radically change your relationship with failure. For many people, encountering a significant setback results in demotivation and often a search for blame. The radically successful are motivated by failure. It pushes them to try again, try harder, or try something different. Their response to failure is to look within for solutions. They possess an internal locus of control. There is nothing in life – not a single thing – that is 100% out of your control. There is always something you could have done differently. You can cannot control other people or circumstances but you can always control yourself, even if the only thing you control is your reaction to external events. It is useless to spend even one minute of time contemplating how other people contributed to your failure. I don’t care if you objectively did things right 99% of the time and only made a 1% mistake. Focus on the 1% and get it right next time. I’ve interviewed over 500 people in my career, the overwhelming majority of which I did not hire. Do you know how many of those rejected candidates emailed me afterwards asking for feedback on what they might have done differently? Zero. Meanwhile I make a point of emailing the hiring manager of every single role I didn’t get an offer on. I thank them for their time and ask them for candid feedback on my interview. Sometimes they don’t reply, but sometimes I get a useful bit of insight into how I could have done a bit better. Each time that happens it compounds, making me incrementally better at interviewing. Occasionally it leads to opportunities with the hiring manager’s peers or consulting gigs. Serial entrepreneur Tom Bilyeu takes this to the extreme, stating that if his wife were to be hit by a meteor and killed in a freak accident he would blame himself. The way he sees it, he is aware there are NGO’s out there monitoring extra terrestrial objects that pose a risk to those of us on earth. Yet, he’s never reached out to those organizations, invested in their success, or monitored their progress. Tom understands the only thing we control is ourselves and our reaction to the things that happen around us. It’s a radical mindset that’s difficult to adopt but remarkably powerful and empowering when you do. It doesn’t matter if you reflect on something big or something small, just do it every day. What matters is the practice of reflection and attuning yourself to look inward for answers. Overtime, this practice will rewire your brain and help you achieve an internal locus of control, the fundamental building block of a growth mindset. One of the things that makes daily reflection so powerful is the habitual nature of it. It becomes a systemic part of your life. That system may only be “active” for 15 minutes a day, but it has a way of affecting the remaining 1,425 minutes. Generally your growth, and subsequently your success, will come from putting systems that develop you into place and doggedly sticking to that system over time. Lots of ambitious people think the key to success is setting specific and measurable goals – amass a seven figure net worth, get married and have a child by 35, lose 15 pounds by summertime, acquire 100K twitter followers, whatever. One of two things happen when you set a goal: you achieve it or you don’t. Interestingly, whether you achieve your goal or not it produces a similar next step – you set a new goal. Ambitious people will always look for the next challenge when they succeed or have the resilience to seek a new one when they fail. But this perpetual focus on the destination doesn’t really work. It’s just another version of focusing on the external instead of the internal. There is a far more satisfying and reliable method for producing real growth – systems. A system can be about anything. Wish you could be more prolific? Write down 10 ideas every single day. Trying to control your anxiety? Practice mindful meditation for 10 minutes during your lunch break. Looking for more energy? 25 push ups, 25 sit ups and 50 jumping jacks every morning before you leave the house. Use your daily reflection to find the mental, physical and spiritual deficiencies in your life. Then, contemplate and execute a system that addresses that deficiency. This practice is far more flexible than goal setting, and the focus on inputs (your system) is another mechanism to shift your locus of control to the internal. The most successful people on the planet practice systems. Oprah keeps a daily grateful journal. Ray Dalio, founder of the world’s most successful hedge fund, attributes his success to a daily mediation practice. The best all time NBA free throw shooter of all time, Steve Nash, would famously “make” every free throw by physically and mentally sinking a bucket before every actual shot he took. All of these systems are endemic to these individual’s meteoric success. Find a system that helps you grow and practice it daily. You will be shocked at how this manifests growth in your life.